Back in 2013, Alexander Hayes, a scientist on the Cassini Mission to Saturn, reached out to us about making a MOVA Globe version on one of Saturn’s moons, Titan, as a gift to his graduate school advisors. 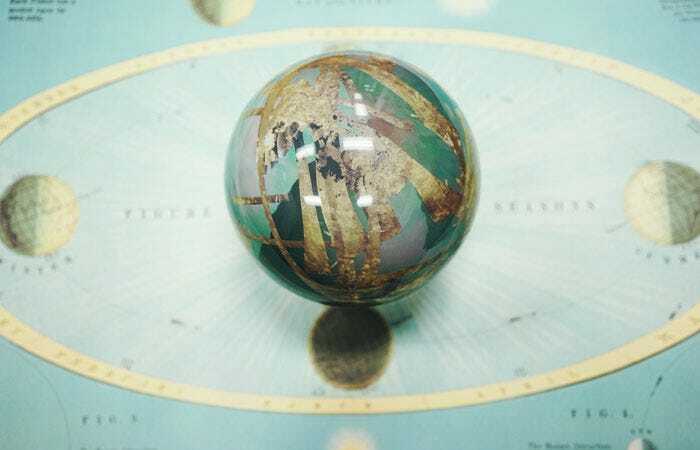 What started as a unique gift turned into one of our most intriguing and different MOVA Globe designs. We wanted to let Mr. Hayes answer the most common questions we get asked about this fascinating celestial body. What is your relationship to Titan? How did you acquire images of Titan? I am a Participating Scientist on the Cassini Mission to Saturn and an Associate Member of the RADAR Science Team. 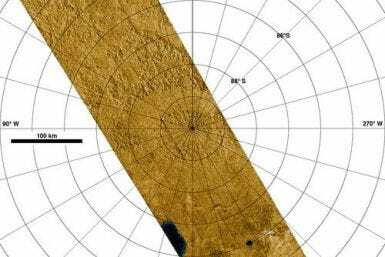 The RADAR is a mapping instrument that was specifically included on the Cassini spacecraft to create images of Titan’s surface. Titan is the only satellite in our solar system that has a thick atmosphere, and that atmosphere makes it difficult for visible cameras to see down to the surface. 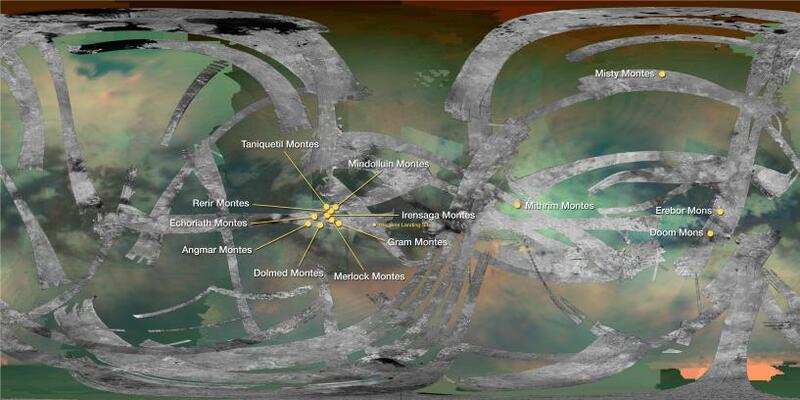 The Titan MOVA Globe features a beautiful image of Titan’s surface from the Cassini mission. When did you know you wanted to become an astronomer? I’ve been interested in space my whole life, but was drawn to Planetary Science as an undergraduate. As a freshman, I started working for the Mars Exploration Rovers for Steve Squyres. I got hooked on large, team-oriented, spacecraft exploration and have not looked back since. 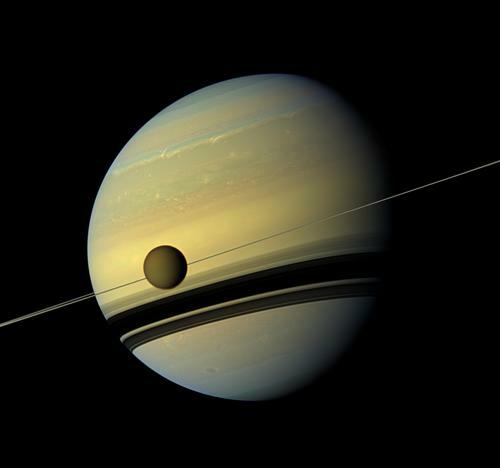 What do the gold stripes in this Titan image represent? The gold stripes are false color strips of RADAR imaging. Since the spacecraft orbits Saturn, and not Titan, we acquire oblique stripes of images every time we fly by. The background color image is a lower resolution global map from the Visual Infrared Mapping Spectrometer, an infrared spectrometer on Cassini. What should people know about Titan? A lot! For example, right now, it is likely raining somewhere on Titan. 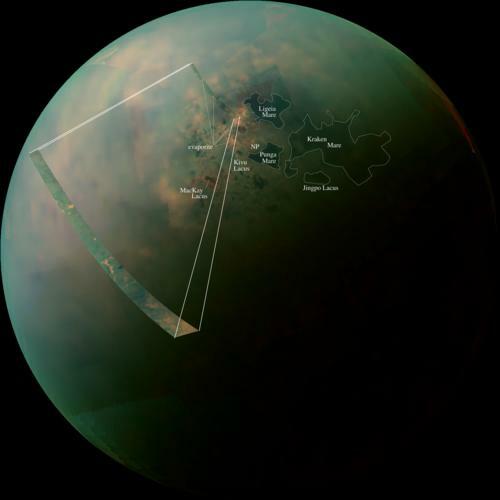 Titan is the only other place in the solar system, other than Earth, where standing lakes and seas are stable on the surface. These lakes and seas are part of a hydrologic cycle that is similar to our own water cycle, except that it works with methane (think liquid natural gas) instead of water. 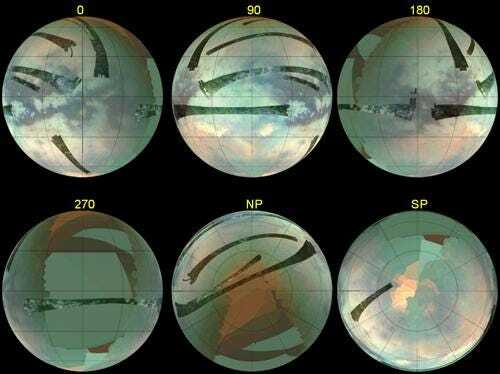 In many ways, Titan’s landscapes are eerily similar to the ones we see here on Earth. You can find sand dunes similar in both size and shape to the largest in the dune fields of the Saharan and Namibian sand seas of Africa. Alluvial fans (cone-shaped sediment flows left behind by rivers, streams, and landslides) resemble those found in the Atacama Desert of central Chile, and mountain chains are formed by tectonic forces similar to those responsible for the Himalayas that span southern Asia. Perhaps most astonishingly, lakes and seas scatter the polar landscape with shoreline features reminiscent of both marine and freshwater coastal environments found across our planet. However, the dunes are not silicate sand; they are instead organic materials more like plastic than quartz. Rather than rock fragments delivered by flowing water, alluvial fans on Titan are a mixture of water ice and organic sediment delivered by flowing hydrocarbon liquids (methane and ethane). The mountains are broken-up sections of dirty water ice, and the lakes and seas are vast pools of liquid hydrocarbons. Despite these differences, the same mechanisms (such as wind and rain) sculpt and transport sediment across the landscape on Titan as they do on Earth. The similarities make Titan a natural laboratory for studying the processes that shape our own planet, including extreme conditions impossible to recreate in earthbound laboratories. How did you come to work with MOVA on a Titan globe? When I finished my PhD, I wanted to get a unique gift for my graduate school advisors that related to my research. 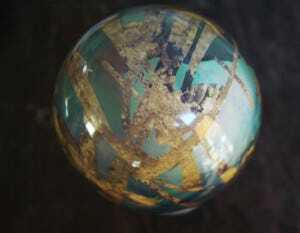 I had known about MOVA Globes, and thought that it would be great to have one made for Titan. What has reaction been like from the people who received the Titan MOVA Globes? 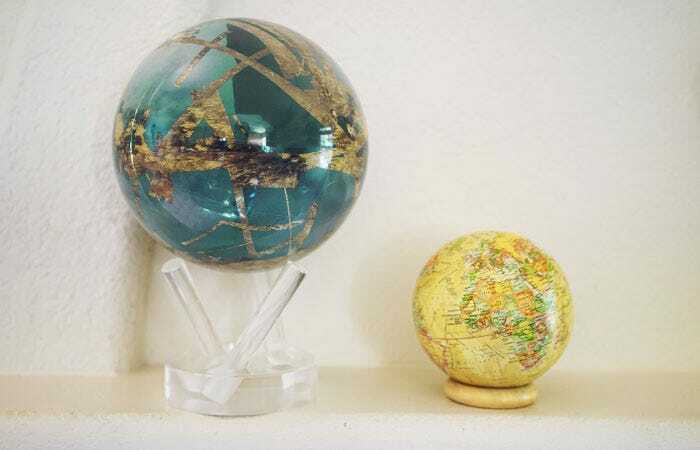 They are ecstatic and routinely tell me that the Titan MOVA Globe was one of the best gifts they have ever received. It is also a great conversation piece, as folks can have hour long conversations trying to figure out how they work. 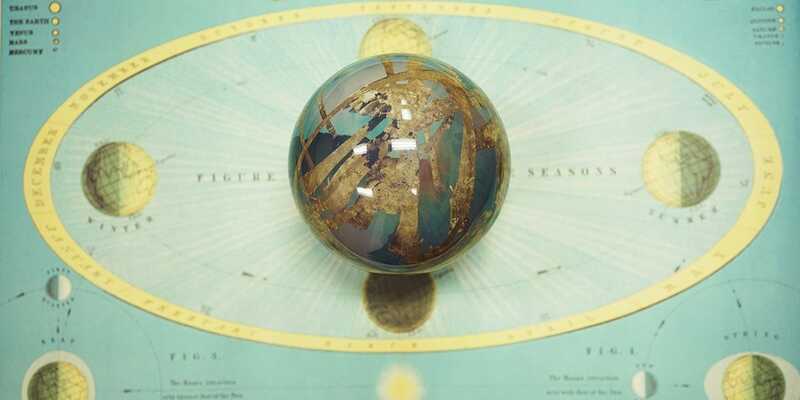 Are there any other celestial bodies you’d like represented on a MOVA Globe? 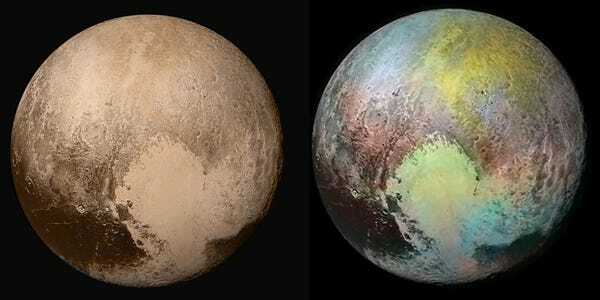 True and false color versions of Pluto. If you’d also like a Pluto MOVA Globe, take our quick survey on which version of the image you’d prefer. For more information on Cassini’s trip to Titan and Saturn, check out this interactive timeline of the Cassini Mission. Note: New images of Titan will be available after the NASA/ESA’s Cassini’s Solstice Mission ends in the fall of 2017.